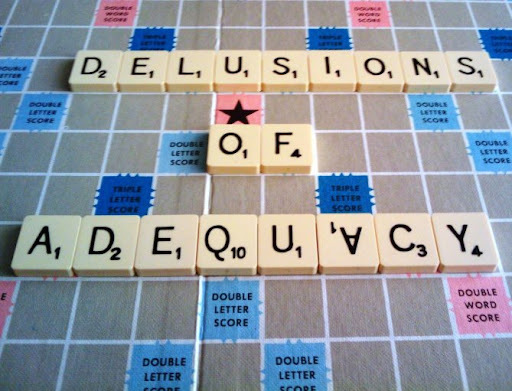 Delusions of Adequacy: Better Never Than Late? I am coming back. I will finish off the Harold story. Been occupied with all sort of other silliness: 2 new jobs and a lot of songwriting/music-making (a lot of it with Don't Feed the Pixies). I now own a total of 5 ukuleles, but I'm not obsessed with them, really, I'm not. I also have 5 cats as well and, OK, I am obsessed with them, obviously. It's about time. Woo to the hoo!!! I've missed you!!! I just whined about the drop-off of participation in blogging (mine included). Inspirational serendipity-doo. You're back! Click here to get fully and quickly caught up with Harold's story. Smart, witty, generous, attractive.....are all things I wish people would say about me.